Elite League champions Belfast Giants are searching for a new coach after Paul Adey's shock departure from the club on Thursday night. A Giants statement said that Adey and general manager Todd Kelman had failed to come to an agreement for next season and mutually decided to part ways. 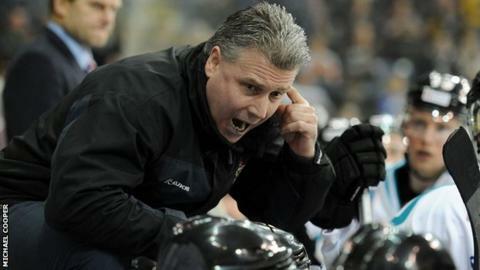 Canadian Adey, 50, was named the Elite League's coach of the year after leading the Giants to the title. Adey's Giants side were beaten in the Challenge Cup and Play-offs finals. Kelman acknowledged that Adey had done a great job for the Giants. "He won a league title and advanced to the finals for the other two major titles," said Kelman. "On behalf of the Belfast Giants players and staff and the entire organisation that we are a part of, I want to thank him for his work and for playing a big part in what we accomplished together as a team this past season. "I wish him well for wherever he ends up next season." Given Adey's achievements this season, he is unlikely to be out of work for long. Adey was appointed to the Giants job last May after Doug Christiansen's departure from the club. After a successful playing career with Nottingham, he coached Nottingham Panthers between 2002 and 2005 before spending several seasons working in Europe.